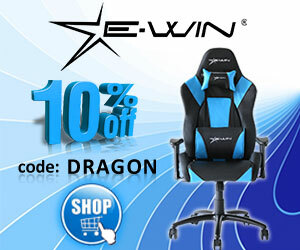 If you’re like me, you’re always looking for better sound when playing games and music. 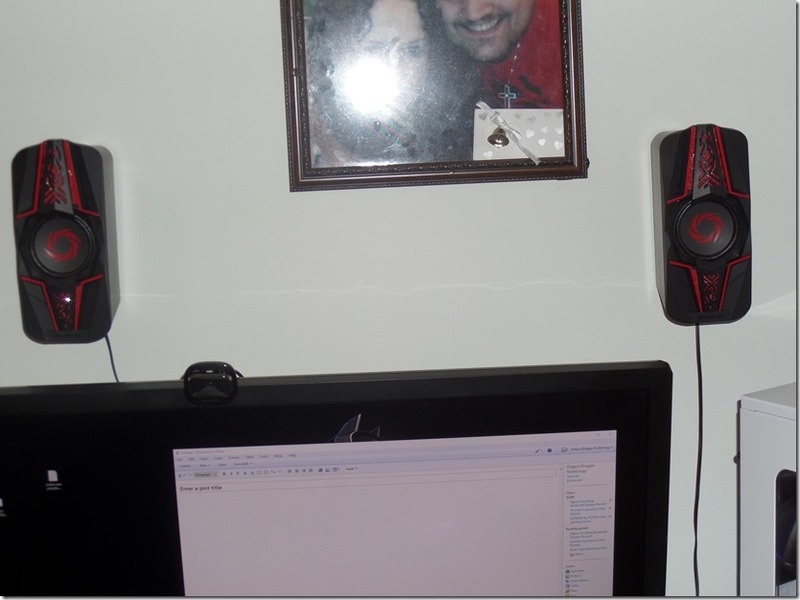 My friends over at AVerMedia sent me their Ballistia Trinity gaming speakers. This is a 2.1 sound system. This system comes with two 3 way satellite speakers, one sub and a control center. It also comes with two cords. I will get more in detail about all that later in the review. 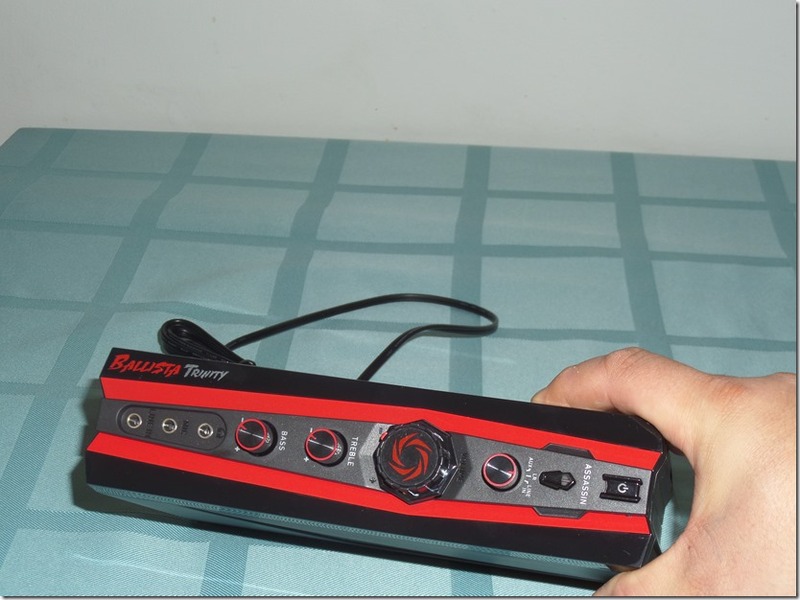 As you can see, it is red and black from the picture on the box. I would love to see a option to change that red out even though I know it’s the companies colors. I may end up paining the red blue later on. Now the color does not hurt the speakers. You Can Watch My Unboxing Here ! Let’s get a closer look at what comes in the package. 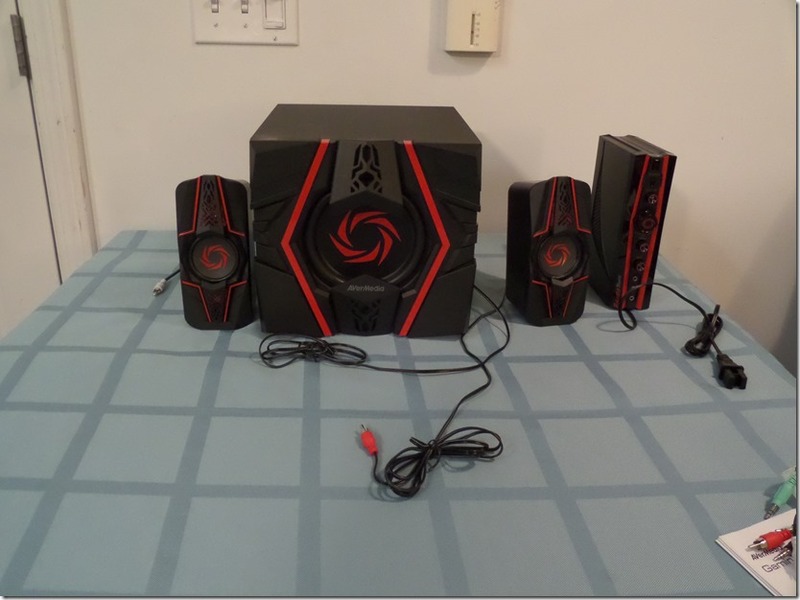 You can see the subwoofer and the two satellite speakers with controller. I will talk about the satellite speakers first. Each one has rubber feet so you can sit them on the desk. If you don’t like that option they have a hole on the back that you can hang them from. You can use a simple thumb tack no need for a large nail. This is great. The speakers are light and hang easy. I placed mine on the wall as you can see in the picture above. Now these are 3 way speakers. This is a twin dual channel 2.75 inch satellite driver, a custom designed 3/4 inch ceramic-metal hybrid with a 1 inch tweeter they claim. Now I did not tear it open to see the tweeter. You can see the driver in the picture it has a flat dust cap with their design. AVerMedia did an awesome job with the design and adding some character to them. The speakers are about 6 inches tall. Each one they claim is 14.5 watts. I will get into if they sound like 14.5watt later on. Each one has its own plug that is connected to it. This plug is a speaker wire with an RCA jack on the end. 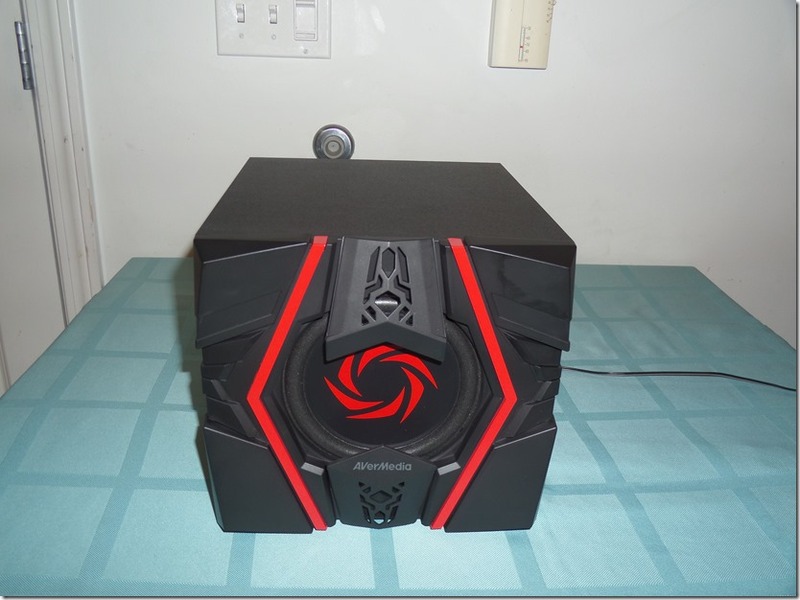 I will now show you a few pictures of the subwoofer. Now the subwoofer is larger in in size will need to be placed out of the way. Now since bass is non directional you can place it just about anywhere as long as the cord reaches. You could get an extender for the wire as well. A plus is that the satellites plug into a single RCA plug. The is a 6.5 inch driver that is 48 watts. Now they claim this is true RMS rating in wattage. The subwoofer has a port on the back side. Which you will be able to see in the next photo. Now this box is light so anyone can lift it. The box has the same coloring as the rest of the set up. In the photo above, you can see the control center/amp. This is the same color as the rest of the set up. The device can be placed on top of your desk. On the front of the device is the Power button,Volume control, Bass control, Treble control, Line in, Mic, and headphone jack. You also have a button that says assassin and input switch. Now the assassin mode button will adjust the level of sound when gaming. It levels out the audio so it is crystal clear. The input button lets you switch between auxiliary, line in, and left/right input. Some of these connection are on the back of the device. You can see the speaker output which goes to the sub and satellite speakers. 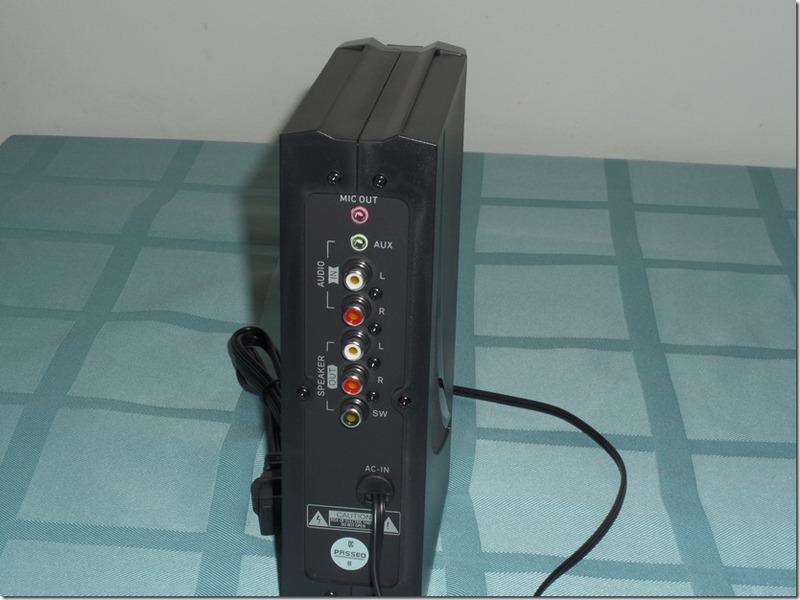 You able to plug in RCA input for another device. You can also just plug in a 3.5mm jack in auxiliary, there’s also mic out so if you use the mic in from you head set you will need to use mic out cord. They supply the mic out cord and the AUX cord in the package. 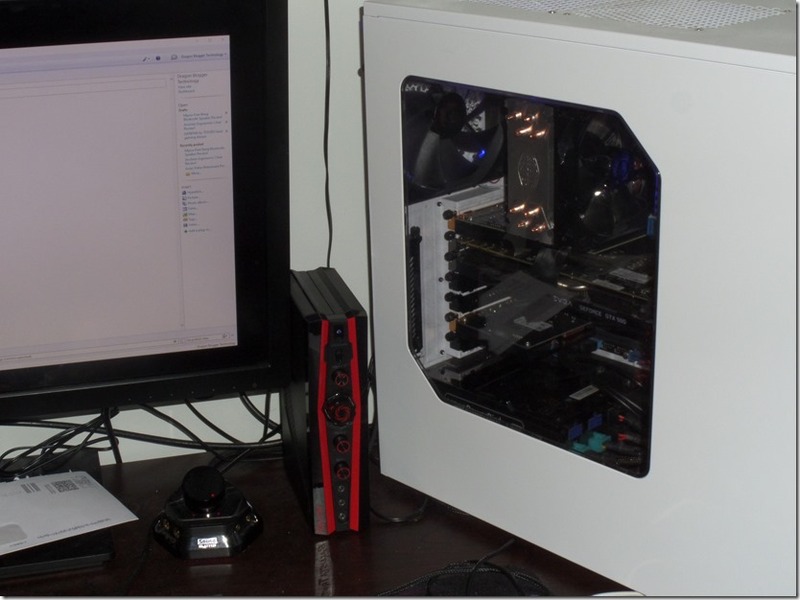 In the next picture you see where I placed the device on my desk. 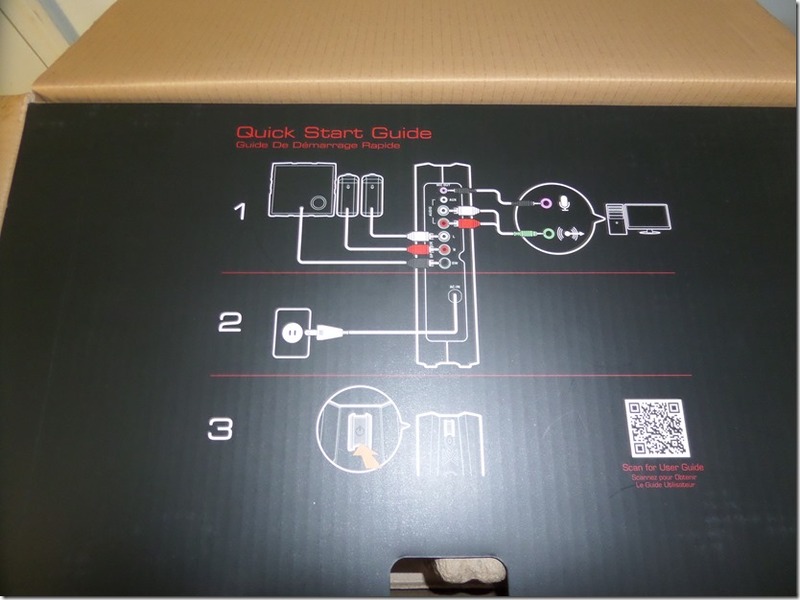 In this next photo, I show a diagram included right on the box lid on how to hook it up. I did not connect mine with the 3.5mm jack since I have a sound card which except RCA plugs. I ran mine that way. They planned well and have provide a few options for connections which is nice. Now they say you can connect this to many devices ranging from PC, Xbox, PlayStation, WiiU, smartphones, tablets, TV, MP3 players, DVD / Blu-ray players. That is a nice list of devices to be sure. I only tested this on my cell phone, PC, and ipod. 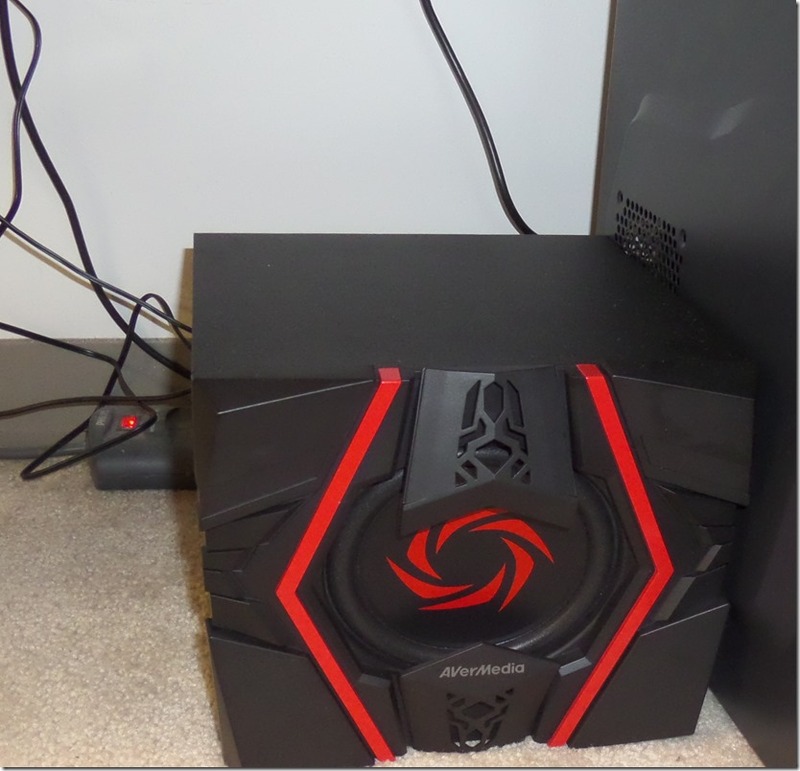 Each device worked well on the Avermedia Ballista Trinity gaming speakers. Now I’m sure you want to know how they sound. Well I was skeptical at first. Since they claim their RMS wattage. I didn’t have anything to test the true wattage with so I went with the good old ear test. The sound is crystal clear, you can hear the treble with ease. The bass fills the room. and makes it sound like it was happening right there. I tested this while playing several game. 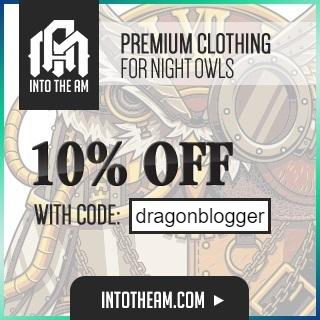 On Arc you would think the dinosaur was right there walking with its foot steps making the room shake. You can hear the chirp of the birds like they were sitting right on your window sill. 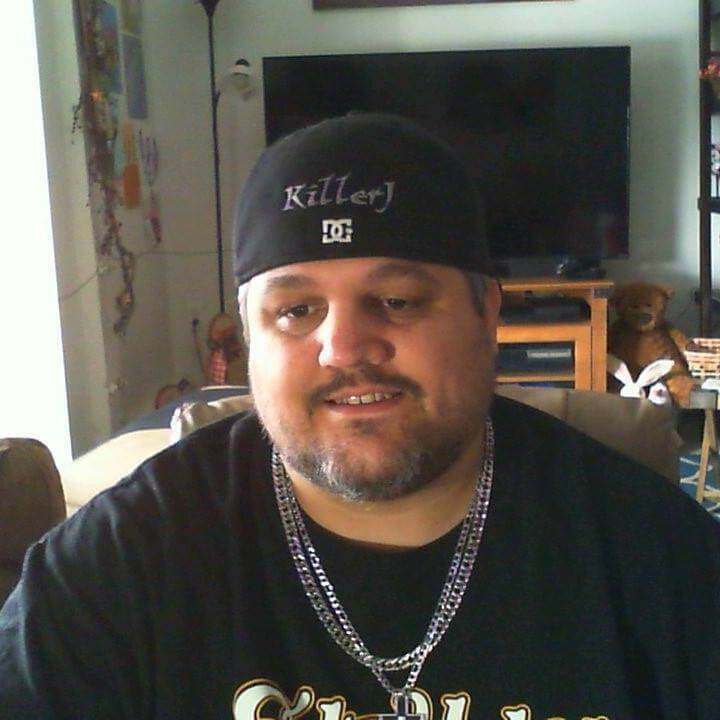 Now playing game like GTA5 you can hear the gun shot like a gun was right there next to you. Even just using them to play music, it sounded awesome and you get that bass you want and that crystal clear sound of your favorite singer or rapper. 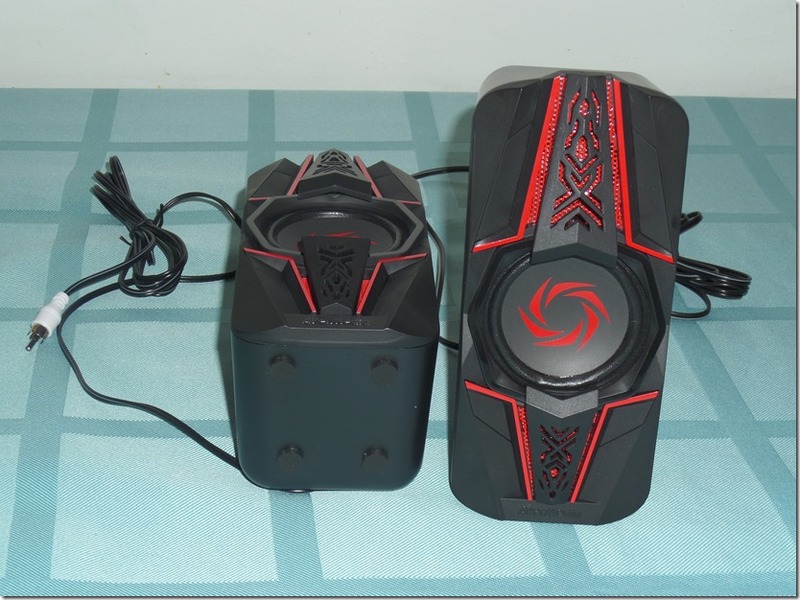 To be honest this set was the best I have heard so far for a gaming speaker set up. I’m sure there may be better out there but to be blunt, this set is well worth the money they ask for. They do have two smaller brothers to the trinity brand, which are lower wattage. I have not had hands on with those so I cant tell you how they work but if this set is any indication, I would say they will be awesome and be more than you would except. 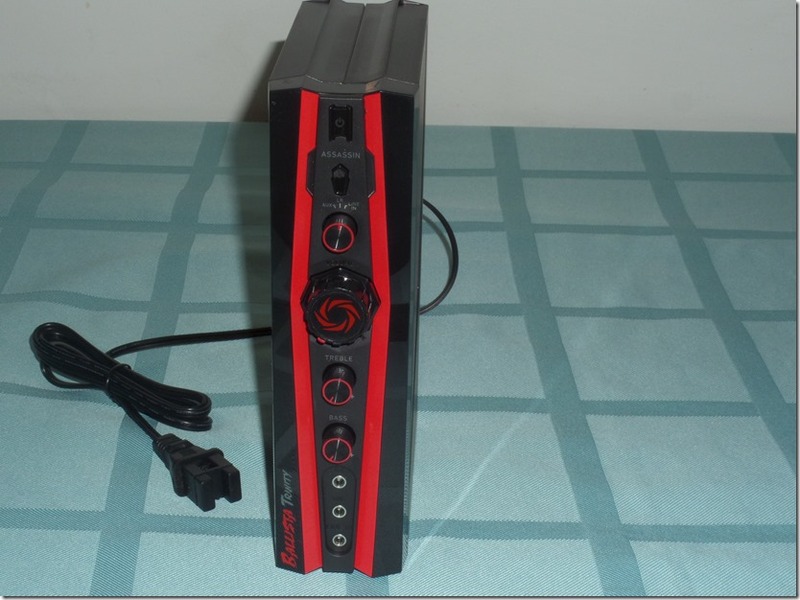 I think AVerMedia did a great job designing the Ballista Trinity Gaming speaker. They are defiantly room filling sound for anything you use it for. I would however like to see a 5.1 surround sound set come out from them. 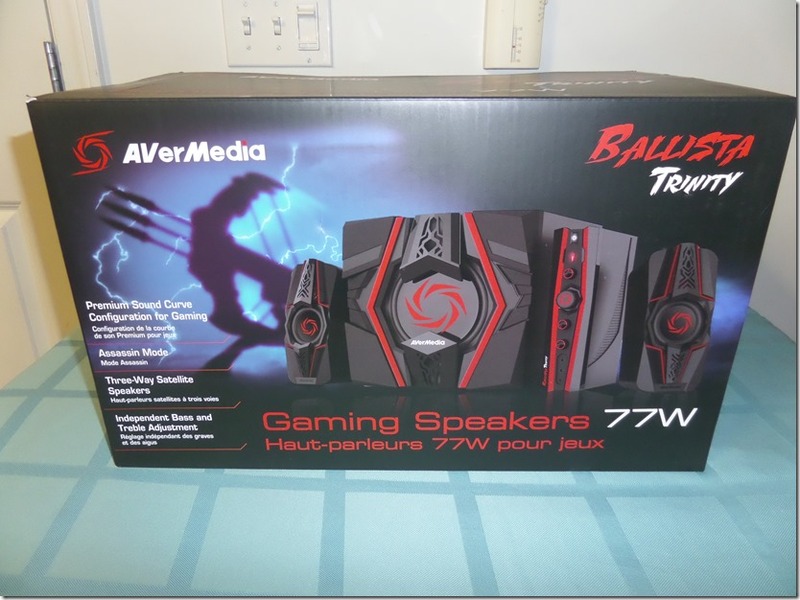 Disclaimer- AVerMedia sent me the Ballista Trinity Gaming Speakers to do a honest review on. All opinions are mine and mine alone.